Hire a boat on the Scottish Lowland Canals from our base at the bottom of the Falkirk Wheel and cruise the Union Canal to Edinburgh and the Forth & Clyde Canal to Glasgow in one week. The whole trip would require you to cruise approximately nine hours a day. Or for a short break, choose your city and either head West or East from the marina. On a boating holiday in Scotland, you can expect to relax and take in the Scottish countryside and marvel at the modern Waterway Wonder of the Falkirk Wheel. This holiday can be a tranquil escape for a weekend or an active week's holiday, depending on you and your crew. A canal boat holiday in Scotland offers a bit of everything - a city break, hiring a boat to explore Edinburgh or Glasgow, navigating aqueducts, locks and the Scottish Lowland 's picturesque views. Or take a more leisurely 10 day trip and explore the extreme Western end of the Forth & Clyde canal beyond Glasgow. Loch Lomond & Trossachs National Park: Explore this park by foot, give water skiing a go, or just relax with a picnic by the loch. The Falkirk Wheel: A unique rotating wheel. Take your hire boat and water from one canal to another via this feat of 20th Century engineering. The Avon Aqueduct: The longest and tallest aqueduct in Scotland, situated on the Union Canal, with breath taking views of Scotland. Edinburgh Castle: The magnificent castle situated on the top of volcanic rock, with its inspiring Great Hall, Royal Palace and Honours of Scotland. 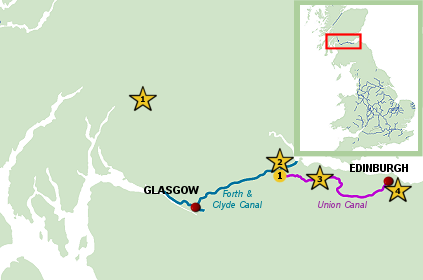 This Scottish canal is a lot wider than a typical canal waterway because it is used as a short cut between the Firth of Clyde (and the Irish Sea) and North Sea to the East. For this reason, similar to many of the wide locks on the rivers, all 38 locks on this canal are manned by Scottish Canals staff. From the Falkirk Marina to the centre of Glasgow, you will navigate only four locks and three swing bridges. (Passage has to be pre-booked direct by the hirer with Scottish Canals at least one week before travel). Moor up and experience Glasgow by foot, a bustling city with plenty of eateries and shopping experiences. For those looking for a tranquil escape you can travel out of the city and slightly further afield to the Loch Lomond and Trossachs National Park. To reach the Loch, just hop on one of the regular buses from Glasgow city centre. There is such a mixture of pastimes to experience here, from water sport activities to exploring the Argyll Forest. Beyond Glasgow there are more locks before reaching Bowling Basin (limit of navigation for hired craft) and connecting to the River Clyde via the Sea Lock. This section has to be completed in one day. Boaters are escorted along this part of the route as the locks and road bridges are opened by Scottish Canals staff. Canal boat holidays in Scotland offer the two cities of Edinburgh and Glasgow, but if you are looking to experience a city break closer to home why not take a look at the variety of city breaks by boat you can explore. This amazing feat of modern engineering was created to rejoin the two canals which had been split since 1933 following the demolition of an 11 lock flight. The Wheel is the world's first and only rotating boat lift and was opened by the Queen in May 2002. Our Falkirk hirebase sits at the bottom of the Wheel. From here you can hire a boat sleeping between 4 and 8 persons and travel to either Glasgow or Edinburgh in a short break or both cities during one strenuous week. Because of some of the lock sizes on the Forth and Clyde Canal the longest narrowboat available for hire is 63ft so boats cannot sleep more than 8 people. This almost lock-free waterway runs from Edinburgh to the Falkirk Wheel, where a flight of 11 locks has now been replaced by this 'wonder' to allow your boat to navigate to the Forth & Clyde Canal, 115ft below. As you approach the Falkirk Wheel from the Edinburgh direction, there are 2 manned locks (Falkirk Wheel Top Locks 1 & 2) which lead into the Roughcastle Tunnel prior to the boat waiting area at the top of the Wheel. This varied canal offers canal boat hirers the best of Scottish views, canal architecture and the cultural centre of Edinburgh. Travelling east from the Top Locks you pass through the 633 metre Falkirk Tunnel which operates on a one way system, managed by traffic lights. Further on you cross the Avon Aqueduct, carrying the Union Canal over the River Avon for approximately half a mile. It is the tallest aqueduct in Scotland and one of the longest in the UK. Edinburgh city is well worth a stretch of the legs, with historic architecture, cobbled streets and entertainers of every kind performing as you amble into the many shops and restaurants on offer. The area is home to a variety of castles including the iconic Edinburgh Castle, towering high atop volcanic rock. Leaving the city you will navigate through villages such as Ratho and Linlithgow on your way to the wheel. Ratho is home to Edinburgh International Climbing arena, if you're in the mood for some adreneline based activities. Holiday in August and visit the Edinburgh International Festival and Fringe events. Click to view the interactive map of the UK inland waterways to find out more about the UK canals and rivers near you.